Names of those in the picture can be found on the photo. I think they used to play their matches on the Well Meadow, close to the brook in Worthen. The team may well have been set up for the first time in this year, 1905. 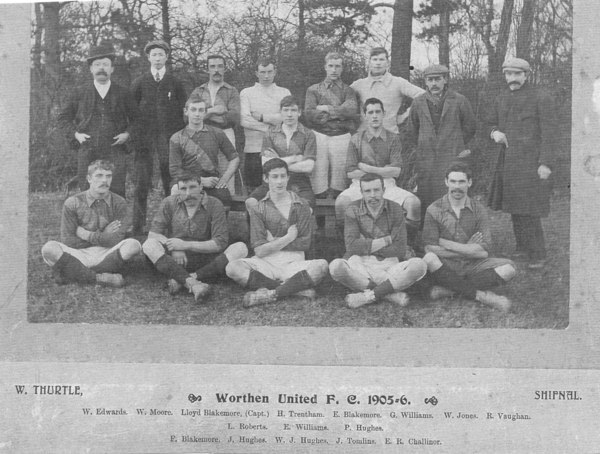 In a report of their match with Snailbeach White Stars in the Shrewsbury Chronicle on Dec 1st 1905 the reporter writes 'Worthen are to be congratulated on having won premier honours in their division for the cup, as it is the first year of their existence as a club.' They were playing in the 2nd round of the Shropshire Junior Cup, and won the game 2-0, W Hughes scoring both goals. In summer 1905 issues of the Shrewsbury Chronicle there are also reports of Worthen cricket team playing matches against [e.g.] Chirbury, Leighton and the County Asylum CC. Several of the football players also figure in the cricket team. Cricket player names that regularly crop up in reports are Rev E G Baker, J Speake, E Williams, F Blakemore, W Hughes, W Speake, L Blakemore, P Hughes, R Vaughan, E Tudor, W R Downes, A Bunce, C Ovey. A much earlier cricket match is recorded between Worthen and Welshpool in the Cambrian News and Merionethshire Standard. This took place on August 17 1872 at Powis Castle Park. The Worthen players were: Ray, Morris, Bolton, R & J Platt, R & W Timmins [Timmis? ], Breeze, Jones, Thomas and Duncan.